“For the past 20 years I have been fortunate enough to work alongside Stan Brock bringing healthcare including Eye Care across Virginia and the United States. I was honored to be chosen by Stan to further his mission and carry it on in Virginia growing from 2 to 10 clinics a year. 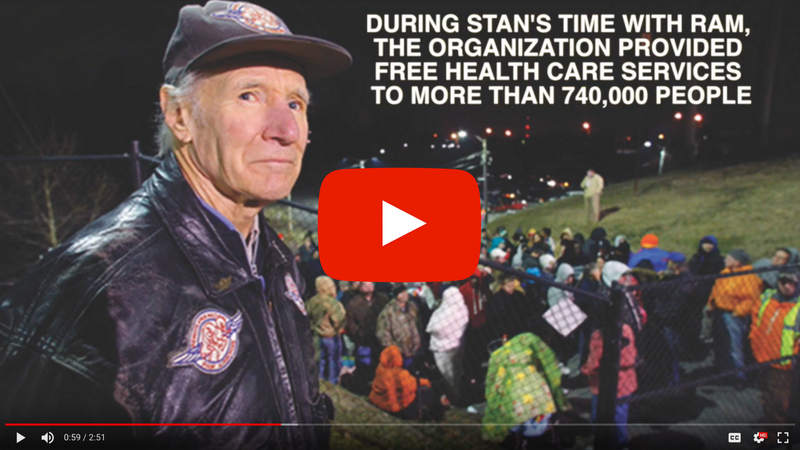 Stan was an inspiration to all volunteers leading by example; providing care without question and worked all day, every day, to help grow the ability to provide services to patients in need. His inspiration with regard to furthering domestic healthcare included expanding states laws to have providers cross state lines. As President of VOSH- Virginia this was really helpful as VOSH members across the U.S. have always answered my call to help in Virginia. Remote Area Medical is saddened to announce the death of Stan Brock, 82, our distinguished Founder and President. Mr. Brock, who passed away on Wednesday, August 29, pioneered the use of mobile medical clinics to deliver health care services to people in remote, isolated, and underserved communities around the globe. During Mr. Brock’s thirty-three-year tenure with RAM, more than 740,000 people attended his clinics to receive free dental, vision, and medical services, all provided by more than 120,000 dedicated volunteers. Without Mr. Brock, RAM would not have been able to prevent pain and alleviate suffering for so many people. While Mr. Brock’s death is a great loss to the organization, RAM will continue championing his legacy and caring for those in need. Mr. Brock built a strong organization led by a dedicated 12 member Board of Directors, 34 staff members, and tens of thousands of volunteers and donors. Together, they will continue to fulfill the mission set by Mr. Brock so many years ago in the jungle of Guyana. A Celebration of Life Service will take place in the coming weeks honoring Mr. Brock and celebrating his extraordinary life. Details are forthcoming, and will be announced on RAM’s social media pages, on RAM’s website, and through RAM’s newsletter. In lieu of flowers, Mr. Brock requests that donations be sent to Remote Area Medical in his memory. Born in Preston, Lancashire, England in 1936, Stan Brock moved to British Guiana (now Guyana) in 1952 to become one of the world’s most recognized vaqueros, or cowboys. There, Mr. Brock managed The Dadanawa Ranch, the world’s largest cattle ranch operation, a 4,000-square mile combination of rainforest and savannah. In 1968, Mr. Brock arrived in the United States to begin a career in television and entertainment. That same year he began co-hosting NBC’s Emmy winning series, “Mutual of Omaha’s Wild Kingdom,” alongside Marlin Perkins. After achieving national fame, Mr. Brock founded Remote Area Medical – RAM® in 1985—keeping his promise to the Wapishana Indians of Guyana. While RAM was initially founded to serve as a safety net provider of free medical care in remote areas of developing countries like Guyana, today nearly 90% of all RAM operations take place domestically. RAM still operates a free, year-round, air ambulance program in Guyana, providing emergency medical transportation to villagers in need of immediate health care services, just as Mr. Brock needed care in the early 1950s. For more information about Stan Brock and this announcement, please click here.